Coway - AP-1512HH : Air Purifier Review • The Air Geeks, reviews of air conditioners, dehumidifiers and air purifiers. Introducing the AP-1512HH, by the Korean brand Coway. Like most air cleaning systems, this Coway air purifier uses a combination of different filtration mechanisms to clean air before it gets to your respiratory system. Satisfied users rave about its effectiveness and silent operation. This air cleaning unit is optimized to reach great performance and ensure that the air in your room is clean and fresh. How well does it actually deliver on this promise? Our review. The AP-1512HH employs a multiple-level filtration mechanism to clean the air that goes through it. It combines some of the most effective mechanisms to ensure that the air it discharges is fresh and clean. Apart from removing the particles, it also eliminates bad smell to ensure that your room is dominated by pure and fresh air. HEPA technology is one of the most effective filtration methods used by air cleaning units. This air purifier employs the true HEPA filtration method to purify the air that goes through it. This highly effective filtration mechanism removes up to 99.97% of airborne contaminants. With this system in your house, you can be sure that the air in your room is free from dust, pollen, mold spores, pet dander, and more. The AP-1512HH has an air sensing mechanism that detects the level of air pollution. If the system runs for 30 minutes without detecting airborne pollutants, it automatically stops the fan to save energy. This smart technology ensures that the air in your room is clean and fresh and it also minds your budget. Most air purifiers are not designed to give you a clear picture of what the system is doing. You are left to assume that the air cleaning system is removing pollutants from the air that goes through it. This air purifier features an air quality indicator. This indicator will help you to know whether the air in your room is clean or not. This air quality indicator uses smart technology to sense the cleanness of the air in your room. When should I change the filter of my air purifier? This air cleaning system is designed to alert you when its filters are worn out. You should not use guess work unless you want to compromise the effectiveness of your air purifier. The Filter Change Indicator lights up to let you know that you should change your filters. The carbon filter lasts for an average of six months while the HEPA filter goes for around twelve months without requiring replacement. 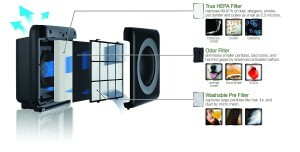 The effectiveness of an air purifier is determined by many factors. Some air purifiers are ideal for large rooms and vice versa. According to the manufacturer, this unit is ideal for a 300-400 square feet space. This means that the AP-1512HH is a suitable air purifier for large living rooms, bedrooms, and so on. In addition, it offers an impressive CADR value of 210. A warranty of 3 years (limited however) tops this offer. One concern though, is that this unit tends to add a few degrees to the room if it used 24 hours or more. The heat is a problem that has been noted on all model of this brand, and it depends on your specifics needs to determine if it is a boon or a bane. Highly effective. This air cleaning system is designed to deliver an impressive performance. Users have expressed satisfaction with its effectiveness. Smart energy-consumption policy. As soon as no air pollution has been detected for 30 minutes, the Coway unit stops running to conserve energy. Sensor issues. A small fraction of users has complained that their air quality sensor does not appear to function well. Such users can therefore not rely on the air quality display. Luckily, only a very small fraction of users have experienced this problem. Heats the room. Some users have observed that the system can cause the temperature of the room to rise slightly. I live in Shanghai (PM2.5 goes over 300), and this has made a huge difference in my quality of life. This air purifier is quiet and small, but very effective. I used to wake up with a sore throat every morning due to the pollution here, but since getting this I've had no such problems. It's even helped keep my skin looking good, since bad air can take a toll even with a good routine. I usually turn the purifier on 3 (loud) when I first get home and keep it there for about 10-20 minutes before turning it to Auto. On bad air days, I keep it on 2 (pretty quiet). I turn it on 1 (very quiet) before going to bed, since the shifts of Auto can be slightly disruptive if you're a light sleeper. Overall, it's made a huge difference in my sore throats and skin. China's pollution isn't so scary if you have something like this to keep you a little bit safer." Bought this while in a deployed environment. Living with three fellow soldiers isn't always the best smelling. So I searched for air purifiers and came across this one. It performs as advertised, it has kept our room clean from dust for a long while now and has made the room very pleasant to be in with no odors! That's the best part! I gave four stars due to the third and highest setting for speed is considerably louder than the others! But really not a big deal for me personally." The AP-1512HH is a mighty air cleaning unit that is designed for large spaces. This system combines different filtration mechanisms to ensure that the air it discharges is clean and fresh. It employs highly effective filtration mechanisms to remove airborne pollutants before they get to your nostrils. In addition, it offers impressive features such as the air quality indicator and filter change indicator. In spite of a few cases where users reported sensor issues (which we did not experience), this is a very good product all in all.